One of the best things about the wine world is the diversity of people – not only due to different ancestry or origin, but in some cases, the diversity involves producers coming from other disciplines. But what happens when you have a producer with the background and mentality of an engineer who has a mission to improve winemaking as we know it? Does it take away the magic? I know this is a current debate among many wine lovers – some feeling we should focus on place and passion. But maybe the science of wine helps us to understand the magic better? These thoughts crossed my mind as I tasted the 2009 Domaine Lois Louise Santa Cruz Mountains AVA samples by Clos de la Tech. This is a crazy time of year for the wine trade and wine writers in the New York City area. They refer to it as O.N.D. (October, November and December). 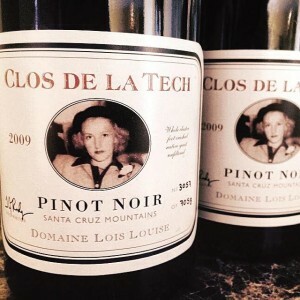 I usually do not ask wineries to send me samples during this time of year since there are so many wine trade tastings and dinners, but I was curious about Clos de la Tech and hence I googled this producer. I found several videos by the owner, T.J. Rodgers. It intrigued me how Dr. Rodgers has combined his engineer mentality (find a problem and fix it) with his passion for Burgundy wines. T.J. Rodgers is the founder, president, CEO, and a director of Cypress Semiconductor Corporation. He is a big deal in Silicon Valley. Honestly, that is not what interested me. What interested me was his winery videos showing him as a man that loved to fix problems, a man that loved wine and ultimately has combined these two passions together. I cannot go into everything he is doing, but one example of the systems and procedures he is using to help improve winemaking is the TJ Experimental Fermenter. It is a tank that can be monitored and controlled (must and cap temperature, measure brix, introduce oxygen at the right moment with pumpovers, etc.) from one central control station. Click on the YouTube video below if you are curious to hear him explain it in a little bit more detail. I think it is very easy to get so caught up in the idea of who T.J. Rodgers is that we don’t even consider that he could be potentially helping other struggling producers with his current experiments and inventions. I was fascinated by the videos of him explaining what improvements he is making in the winery and vineyards because I saw a man who was an engineer in his very being – similar to every other engineer I have known. Good engineers do not change something just for the sake of changing it – they see that there is a problem and they have it in their DNA to try to improve it. As a wife of an engineer, I understand that mentality well! But why do improvements by understanding the process sometimes get translated into taking away the magic? It is interesting that T.J. Rodgers loves the wines of Burgundy – I would say that Burgundy is considered to be one of the most magical places in the wine world. Also, those who drink Burgundy, especially Pinot Noir, would say it is one of the most inconsistent wine regions in the world. When I think of my own travels to Burgundy and visiting small producers, I loved how many would say that they had no idea why things worked how they worked – they just trusted what their parents and grandparents did before them. And when an exceptional wine is made in those sorts of “mysterious” ways, it is magic – there is no formula to figure it out. Conversely, why is a formula that helps to not “mess up” what Mother Nature has already given us a bad thing? Aren’t the sometimes radical climatic conditions magic enough? Don’t we, as consumers, as well as producers, want some sort of minimum level of quality? There are the wild wine nerd wines (and I am a wine nerd) that will always be given some leniency by their small niche following. But the wine drinking world in general expects more consistency since quality and consistency around the world has greatly improved. Dr. Rodgers talks about honoring the heritage of the Burgundians: using French clones, native yeasts and gravity flow, but he has also invented a fermenting system that has a greater capacity to monitor and control temperature. He has even donated several experimental tanks to UC Davis. It could potentially not only help other producers to guarantee a higher quality of wine but it could lower costs by its efficient design. Since wines are an agricultural crop I think there will always be a magic to the process -because there are many things about this grand planet we do not fully understand. There is a balance in making sure wine making is not so much of a mystery and yet still stays somewhat magical – that way the winemakers and wine drinkers alike can have some assurance of having a nice bottle of wine, and hence, we can enjoy the magic that much more. I tried two bottles and both were consistent in their profiles and quality levels. Each one was hand numbered with one being 3057 of 7058 and the other 3098 of 7058. A big wine that is generous at a relatively youthful age but I would decant it for a couple of hours since I thought it showed a lot more through time. It has a great muscular structure that would be typical of Nuits-Saint-Georges wines in Burgundy, but balanced with a rich, fruit forward quality that also reminds me of Vosne-Romanée. A deep ruby color that has notes of black cherry, anise, tobacco leaf, hints of red clay and a powerful, sustained length. The wine is named after T.J. Rodgers’ mother, Lois Louise, whose picture graces the label. The picture was taken after World War II ended and she was just released from the army. Also, his wife, Valeta Massey, is also co-owner and assistant winemaker. Their Domaine Valeta wine is named after her, and their Domaine du Docteur Rodgers is named after T.J. Rodgers. As they always say, behind every great man there’s a great woman – in this case there are two. This entry was posted in Uncategorized and tagged Magic, Pinot Noir, Science. Bookmark the permalink.